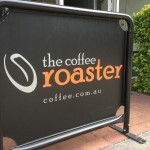 Brisbane has quite a few boutique coffee roasting companies and one of these, “The Coffee Roaster”, is next door to our office in West End. When it first started to serve coffee last year I tried them. To be honest, it wasn’t great, and so I returned to my regular cafe for my daily caffeine hit. This year however I was enticed back when a couple of people from the office indicated that the coffee was vastly improved. 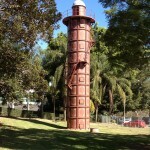 As you walk along the river bank near Davies Park in West End you come across a large metal tower. Reminiscent of a lighthouse, it sits in a small grassed area surrounded by large fig trees behind a high metal fence . 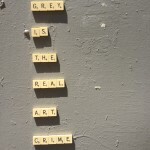 But what is it? We recently promised a friend of ours the best lasagne in the world. 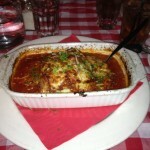 When we finally took her to Elio’s Osteria their lasagne had alot to live up to. It didn’t disappoint. 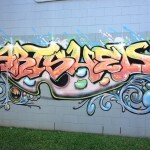 I found this collection of graffiti just off Vulture Street in West End recently.